To make sauce: In Dutch oven or 5 qt-saucepan, bring 5 cups water, tomatillos and peppers to a boil; boil uncovered until tender. Reserve liquid. Cut off pepper stems, discard. Meanwhile, in small nonstick skillet, heat oil until hot over medium heat. Add 1/2 onion and garlic; cook for 1 to 3 minutes or until golden brown. In Dutch oven or 5-qt saucepan boil water, stir in chicken breasts and 1/2 onion; cook for 20 to 25 minutes or until chicken is completely cooked; shred chicken. In medium nonstick skillet, heat chicken and salt until warm. In blender container, place tomatillos, peppers (stemmed), onion and garlic mixture, avocados, cilantro, green chilies, salt, pepper and about 3 cups liquid from Serrano cooking mixture; might need to do in batches. Blend until smooth. Meanwhile, heat oil in 10 or12-inch nonstick skillet until hot. Fry tortillas until crisp but still bendable one at a time for about 20 seconds, turning each tortilla over once. Place about 2 tablespoons chicken down center of each tortilla; top with about 1 tablespoon Queso Fresco; roll up. Place in ungreased 13x9-inch baking dish; seam side down. Top with sauce as desired on top and sprinkle with Cojita cheese. Bake 15 to 20 minutes or until cheese is melted. Sprinkle with green onion slices and dollop with crema or sour cream. Vegetarian Enchiladas – In 12-inch nonstick skillet, melt 2 tablespoons butter. Add 1/2 cup chopped white onion. cook for 2 minutes. Stir in chopped fresh mushrooms (button), 1 cup of cooked and sliced nopales and 4 green onions (only the white part of the onion). Cook until tender. Assemble like the chicken enchiladas and add cheese if desired. Makes about 14 enchiladas. Enough sauce to make chicken and vegetarian enchiladas for a dinner! Extra sauce could be frozen in resealable bags or in an air tight container. Only remove from freezer for next use. Use for chilaquilles, flautas or Huevos ahogados (eggs in salsa). 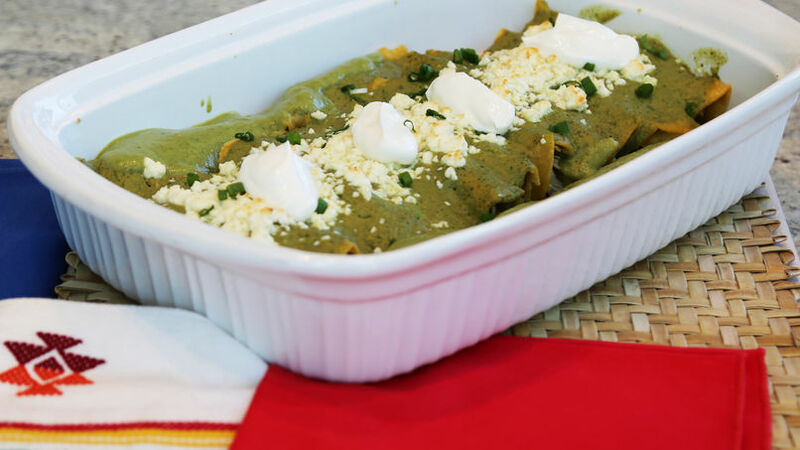 A real authentic meal coming directly from Mexico, Cilantro Avocado Enchiladas yum! !